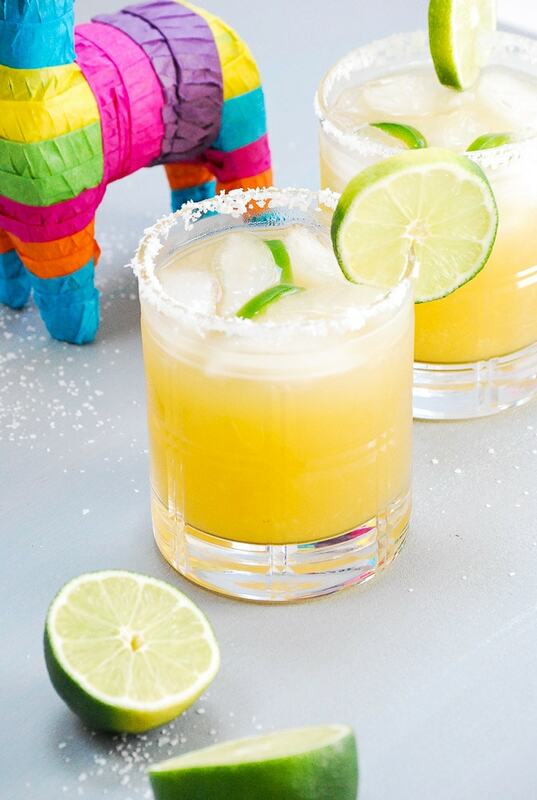 Nothing says ‘fiesta’ like a margarita! Am I right? And making it from scratch using fresh pineapple takes it to a whole new level of fiesta. Actually, it kind of takes it to a whole new level of danger considering it’s easy to chug 3 or 4 of these in an hour, therefore making for an eventful evening. Between Cinco de Mayo and summer just around the corner, I thought these margs are the perfect thing for your next gathering. I absolutely love the taste of a sweet, juicy, pineapple. It’s so refreshing, and pairs perfectly with the tangy lime juice and spicy jalepeño. But truly, you could use whatever fruit you like. Strawberry, mango, watermelon. I made this last weekend for an event I hosted called Dinating at Home. I am abnormally excited to share the details of the evening with you, coming TOMORROW on the blog. It was so good. Dinating at home is gonna take over the world. Or the nation. We’re thinking BIG, people. Just remember I said it. In the meantime, make yourself and all your friends a pitcher of these trusty margaritas. And maybe some turkey tacos to go along with it. 1) Make the pineapple simple syrup. In a small saucepan combine the sugar and water bring to a boil and let sugar dissolve, then turn off heat and let cool completely. Combine 1 cup simple syrup and 1/2 pineapple (peeled and cubed) in a blender and blend until combined. 2) To make the margaritas, rim the ridge of your glass with a lime wedge and dip in salt. Fill the glass with ice. In a cocktail shaker, combine tequila, grand marnier, lime juice, and simple syrup with ice, and shake for about 30 seconds. Pour over ice and squeeze in lime slices. Garnish with a few jalapeño slices with the seeds removed. This recipe can easily be multiplied!